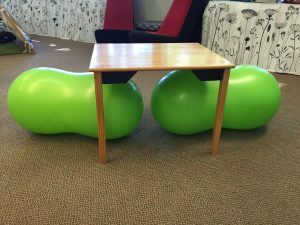 The Flexible Seating or Flexible Class is a popular topic these days in the Quebec schools. Since our team of ergotherapists receive lots of question on the subject we decided to write an article. 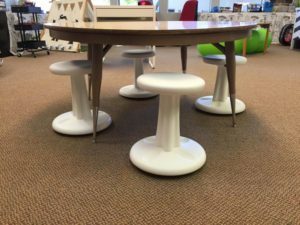 Flexible Seating seems to be a new and rapidly growing trend. To further specify, Flexible Seating suggests to remove students desks and chairs to introduce different work surfaces and different types of seating to allow children to move and maximize their attention and motivation in class. We, ergotherapists, have been for many years encouraging the integration of sensorimotor pauses in class as well as using movement during the learning process. Our team recommends regularly to use alternative postures to work (lying on the stomach, standing against a wall, kneeling, etc.) These alternative postures, while helping with the postural control, allow children to move, regulate themselves and remain more attentive. 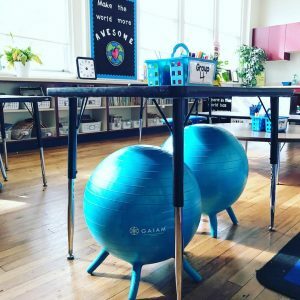 Thus, the principles behind Flexible Seating have common points with what we have been advocating for several years. What shoud I be thinking of before transforming my class into a flexible class? While elaborating this class model and working stations, think about having different types of seating and work surfaces to accommodate the different anthropometric measures (sizes) of students. It is important for the students’ heels to remain on the ground and for the work surface to be at the elbow crease level. It is preferable to use unstable seating (air cushion, ball chair, etc.) for a maximum period of 15 to 25 minutes in order to prevent fatigue that could occur. As a matter of fact, a child with postural control problems will have more difficulty to sit on an instable surface than a chair well adapted to his size. If fatigue occurs the attentional capacities will be reduced… and that is not what you want! When doing a graphic task (writing, coloring), make sure that the student can use a stable surface. Thing about the position students will adopt to listen to instructions. We wish to avoid regular rotation of the trunk. First, keep in mind that the students will probably be disorganized by this sudden change. They will benefit from it if you explain the gains and let them have several exploration periods. You can do guided exploration periods where the students will comment on the effect the different equipments have on them, what they like and what they like less. Think about creating working stations that will allow them to work standing, sitting and lying on their stomach.